When BlackBerry first announced the KEY2 back in June, the biggest gripe we heard was about the price. It was reasonable criticism, as BlackBerry was asking a lot of its consumers at $650. Knowing this, BlackBerry went back, made some downgrades, and cut the price, creating the KEY2 LE. The BlackBerry KEY2 LE is a scaled down version of the KEY2. To cut $250 off the price tag, BlackBerry had to water down several aspects of the phone. Fortunately, they didn't scale down the core specs too much to hinder overall performance. The result is a KEY2 that will probably make its way into the hands of far more people than the regular version ever could. Let's start with what carried over. BlackBerry kept the same display as the KEY2, the 4.5-inch IPS LCD panel. While on paper this seems pretty small, it isn't as small it appears in person. Its smaller size was also necessary to include the standout feature of the KEY2 LE, the keyboard. The physical keyboard is mostly the same as its brother, although TCL (who manufactured the hardware) shrunk the keys by 10%. However, with such large keys on the KEY2, most shouldn't even notice the differences. The front camera is also the same as well. BlackBerry managed to carry over the 8 MP selfie camera capable of shooting up to 1080p video. More importantly, the KEY2 LE retains BlackBerry software, the second most important feature of the phone. The KEY2 LE runs the same version of Android, 8.1 Oreo, along with all the changes found in the regular version, such as DTEK security, the Privacy Shade, and BlackBerry Hub. Additionally, the new "Speed Key" which allow you to launch an app assign to individual keys even while in another app return as well. Also, the "Convenience Key" and its intelligent profiles return as well. Here's where things get a little harder to swallow with the KEY2 LE. 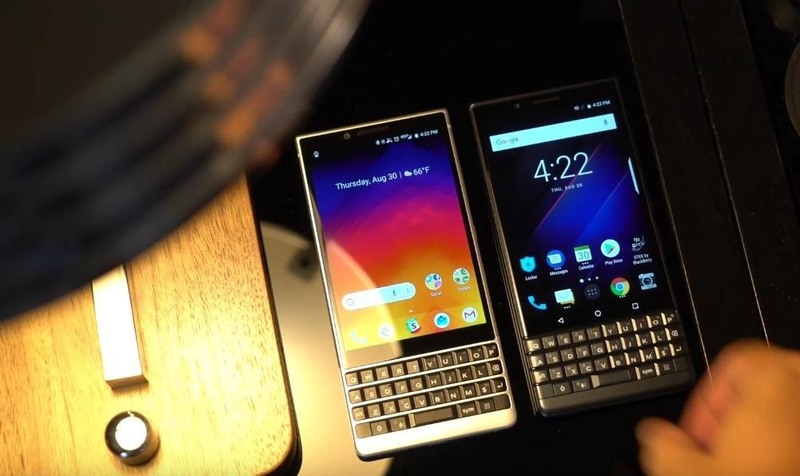 BlackBerry changed five major aspects of the KEY2 when releasing the KEY2 LE, and four of those are downgrades. Typically, when a manufacturer makes a lite version of a phone, the first downgrade is to the SoC, and the KEY2 LE is no exception. Despite using a newer chipset in the Qualcomm Snapdragon 636, the KEY2 LE's processor can best be described as an under-clocked Snapdragon 660 (the processor used in the original KEY2). The SoC is also paired with a slower GPU, but the original KEY2's GPU wasn't anything special to begin with. The RAM takes a hit, too, dropping from 6 GB to 4. While Android operates well on 4 GB, the OS strives on higher amounts of RAM. By no means will this dramatically affect the KEY2 LE's performance, but it will limit the number of apps you can have running in the background. With a less power-hungry SoC comes a smaller battery. Battery capacity decreased by a little over 14% to 3,000 mAh. However, the KEY2 had room to spare in this department, as the regular version easily lasted more than a day (sometimes two depending on your usage). Internal storage also decreases, starting at 32 GB instead of the KEY2's 64 GB base model. You can still get the KEY2 LE in 64 GB, however, but the price will rise by $50. The cameras took the biggest hit, going from dual 12 MP to a 13 MP and 5 MP sensor. While this may seem like a dealbreaker, the KEY2's original cameras weren't all that great to begin with. BlackBerry attempted to make them serviceable, but it clearly wasn't their focus, so just like the KEY 2, don't buy the LE if you want (or need) a fantastic camera. One of the nifty features of the KEY2 was the ability to use the physical keyboard as a trackpad. You could scroll up and down to navigate web pages, and left and right if there was additional content horizontally. Unfortunately, this was sacrificed in the name of price. The trackpad had limited support in the first place, but was a convenience when you could use it. Fortunately, the space bar that doubles as a fingerprint scanner was able to remain. With this new LE model not be marketed to enterprise users, BlackBerry decided to have some fun with the colors. The KEY2 LE will have three new colors: Slate, Champagne, and Atomic. Each is fun, and they're all more standout colors than the traditional black and silver of the KEY2. The BlackBerry KEY2 LE will be available on October 12 in Slate. The Champagne color will ship later, on November 2. The 32 GB model will retail for $399, with the 64 GB model increasing to $449. You can pre-order the phone now via Amazon. The device will come unlocked and will work on AT&T, T-Mobile, and Verizon. Again, this is $250 in savings for a phone that's amazing at security, different, and has fantastic battery life. If you were interested in the KEY2 but didn't like the price, this is the phone for you. The Key2 LE isn't just a downgrade. Using plastic parts inside of metal, BlackBerry was able to reduce the weight of the phone by a few ounces. It also included a new feature where the phone reads your calendar and recommends what battery percentage you should leave the day with based on how busy your day looks. Small things, but helpful changes.